Murres fly in Akpa North Bylot Island Migratory Bird Sanctuary. Margaret Wente is spending 12 days with the Canada C3 Expedition, which is circumnavigating the Canadian Arctic to mark Canada's 150th birthday. She will be with the C3 ship from Pond Inlet through the Northwest Passage. 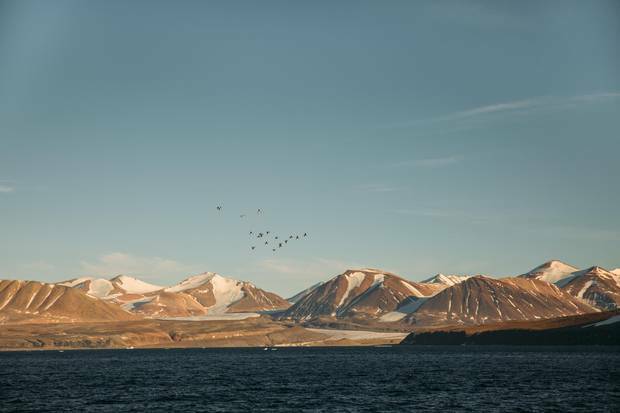 At a latitude of 74 degrees north, the Arctic is a magnificent yet forbidding place. Even on a mellow August day, the wind can sting you into submission. Ice crystals glitter in the water. In a few weeks they will solidify and the short summer will be over. For the past 4,000 years, Dundas Harbour, located near the north coast of Baffin Island, has been home to nomadic Indigenous hunters. A baby named Elisapee Ootova was born here in 1932 or thereabouts, to a traditional family of hunters. Today her granddaughter, Jena Merkosak, is visiting her grandmother's birthplace. It's an emotional moment. "She is an incredible woman," Jena says with tears in her eyes. Ms. Ootova grew up to be a woman of formidable accomplishments. She wrote the first Inuit dictionary. This week, she gave the blessing at the signing of a historic agreement that will make her birthplace – along with the vast area around it – a protected place forever. The Lancaster Sound marine conservation area will be twice the size of Nova Scotia – the largest protected area in Canada. Among many other things, it ensures that no one will ever drill for oil in the Northwest Passage. Its Inuit name will be Tallurutiup Imanga. Today Ms. Ootova lives near her granddaughter in Pond Inlet, a small town in Nunavut, south of here. Jena, who's 26, goes to nursing school in Iqaluit. 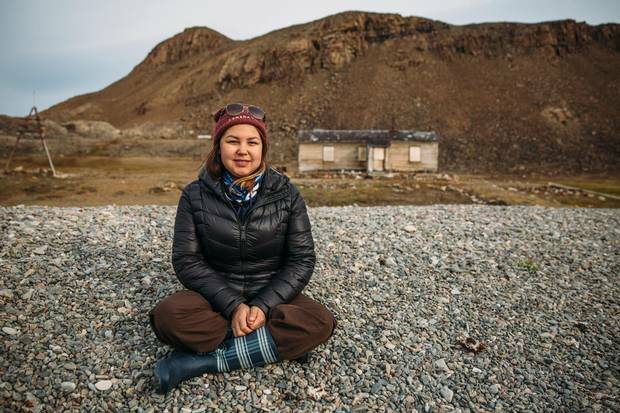 She is already part of an emerging generation of Inuit leaders – confident, outspoken, and comfortable in both worlds. She is as tough and resilient as her grandmother. It's her generation, not people from the south, who will shape the future of a land mass a fifth the size of Canada. Ever since the first European explorers arrived, this land has been contested. The Europeans dreamed of vast riches – gold and other precious ore. The Franklin expedition (and many others) came to grief here. Later, white men from the south dreamed of oil and gas. To them it was a vast treasure trove on top of the world. Lancaster Sound is strategically, as well as ecologically and historically, significant. It's the eastern entrance to the Northwest Passage and the Beaufort Sea. At Dundas Harbour, both the RCMP and the Hudson's Bay company set up remote outposts. Jena's great-grandfather acted as a guide who showed them how to survive. But the Inuit were never true partners. That was just a myth. To Jena's ancestors, this land was another kind of treasure trove – a place of spectacular abundance. To this day, colonies of nesting birds breed on the cliffs. Bowhead and beluga whales swim the waters, and polar bears sun themselves on the ice floes. There are walrus, muskox, and most of the world's narwhal population. "It's not just an empty land," Jena says. "It's an ecosystem where everything is connected." 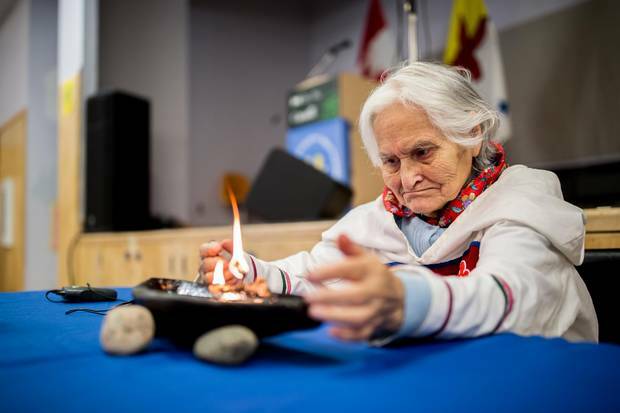 Elisapee Ootova, Jena Merkosak’s grandmother, lights a qulliq before the announcement of the new protected area of Lancaster Sound. In the spotlight at the signing ceremony in Pond Inlet was Catherine McKenna, the federal Minister of Environment and Climate Change, who spoke emotionally about the deal. The federal government was eager for it. It combines two of the Liberals' leading themes, the environment and reconciliation, in a way that everyone can celebrate. On stage with Ms. McKenna were the usual local dignitaries. One was a wizened man with a weather-beaten face and long grey beard. I learned that he was John Amagoalik – the man who, perhaps more than anybody else, brought self-determination to Nunavut. "When we first started dealing with government officials they didn't take our claim very seriously," he told me. "It took them many years to understand." Mr. Amagoalik has spent most of his life leading the fight for self-determination. He knows better than most people what it's like when powerful outsiders take it away. Mr. Amagoalik was born to an Inuit family in northern Quebec. When he was six, the government forcibly relocated his family and several others to Resolute and Grise Fiord – two of the harshest settlements in the Arctic. They found themselves thousands of kilometres from home, in a place they didn't understand. To hear more stories from aboard the C3 expedition, check out the Canada C3 podcast. The government claimed it had moved them for their own good, because hunting conditions had worsened in Quebec. Some suspected that it wanted to use these families as "human flagpoles" to assert sovereignty in the remote north. What's indisputable is that the government broke its promise to provide better living conditions and hunting supplies. The group was broken up and essentially abandoned in a hostile land. Their name for Resolute was "Qausuittuq"– the place with no dawn. "It was horrifying," remembers Mr. Amagoalik. "Northern Quebec is green and has lots of animals. Resolute was like a moonscape. The only animals we could see were starving muskox." 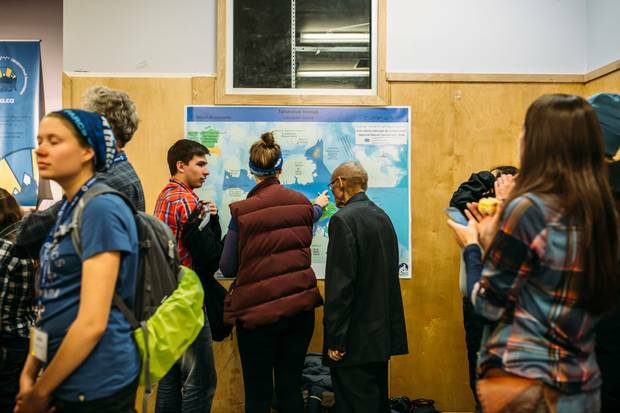 People examine a map of the new protected area of Lancaster Sound. His family almost starved, too. Eventually they moved back to Quebec. He stayed on. He lived in Resolute for 19 years before moving to the relative luxury of Pond Inlet. In time, the families came to be known as the High Arctic exiles – powerful symbols of government abuse of power. Mr. Amagoalik was in his early 20s when he began the long fight to reclaim the land. "We had to educate Canadians as to who the Inuit were," he says. "We also had to explain to the elder people what claiming land was all about." The concept of borders was alien to them. "Why do we have to claim land?" they'd ask. He and his allies were tough, strategic – and very patient. They were willing to wait and wait until the right moment. These are the same skills of the legendary Inuit hunters. In 1993, their strategy paid off when then-prime minister Brian Mulroney signed the historic land claims agreement that gave the Inuit of the central and eastern Northwest Territories a separate territory called Nunavut. Mr. Mulroney didn't want to do it, Mr. Amagoalik told me. But by then, Canadians knew who the Inuit were. Their cause had won wide support, and an election was in the works. "We were tough," Mr. Amagoalik says. "We told the minister, if you don't want to sign, go away." They signed. Mr. Amagoalik spent the next six years leading the detailed planning for the new territory of Nunavut. The federal government formally transferred power in 1999 – along with $1-billion in funds over 14 years. The government eventually settled with the High Arctic exiles, too. There was no choice – the Inuit evidence of abuse was overwhelming. A compensation fund was established for the families and their children, and they got a formal apology in 2010. For many people here, however, the bitterness remains. The exiles had become a symbol of tens of thousands of other Inuit who had been forced off the land and resettled against their will, for the convenience of bureaucrats who had vowed to protect them. 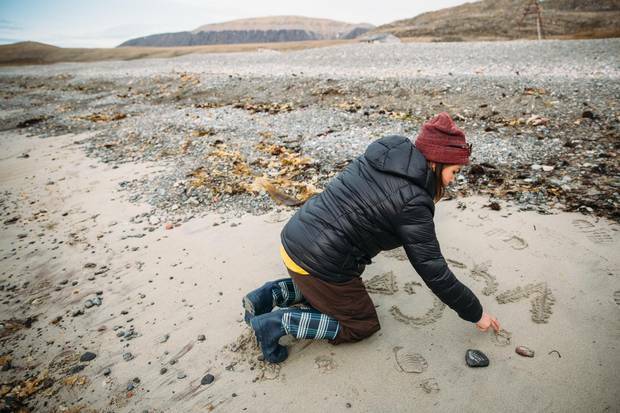 Jena Merkosak writes her grandmother’s name in the sand at Dundas Harbour. The creation of Nunavut was not the end of the drive for sovereignty. The Inuit still had no control over oil and gas exploration in Arctic waters. For that, they needed to strike an agreement to establish a protected area. They found strong allies in the environmental movement. But the federal government was reluctant to give up its oil and gas rights, which represented a potentially lucrative bonanza. The boundaries were contentious, too. The fight to establish the boundaries of the Lancaster Sound marine reserve dragged on for years. One logjam broke in 2016, when Shell Canada was persuaded to relinquish its oil and gas permits in the area. "They deserve full credit for that," says John Lounds, the head of the Nature Conservancy of Canada, which brokered the deal. The Inuit also persuaded the federal government to use Inuit traditional knowledge about historical hunting grounds to set the boundaries. By the time the deal was struck, the government had agreed to double the original size of the protected area. The deal will also include significant money from the government for economic development, mostly in infrastructure for ports and airports. Conservation is all very well – but people here also want their kids to have jobs. The Inuit have told Ottawa that if it wants international applause for its environmental efforts, the residents must benefit too. Mr. Amagoalik, the father of Nunavut, turns 70 in November. He has achieved almost everything he wanted. But it's his children and grandchildren, not he, who will reap the rewards. "He's given his life to changing Canada," says someone who knows him. "And I'm not even sure he can make the mortgage payments." Jena Merkosak at Dundas Harbour. As a nurse practitioner, she hopes to explain Western medicine to older members of her community. The Inuit name for Dundas Harbour is Talluruti, Jena told me. That's the word for the traditional chin tattoos of an Inuit woman. The striations on a mountain in the harbour reminded people of talluriti. There are many words the Inuit use that have no equivalent in English, she notes. Like most people who live up here, Jena's family still has strong connections with the land. People, especially the older ones, still eat country food – muktuk, seal and slightly fermented clams that come from the stomachs of walrus. Their sense of connection with animals remains profound. "Death spells the nourishment of life," goes one Inuit poem, "and the seal becomes the boy." For many young Inuit men, their first big catch (the word that's often used instead of "kill") is still a rite of passage. Jena likes to go seal hunting with her father, a construction manager. She caught her first narwhal when she was 17. It was a little one – its tusk was just six inches long. Her father showed her how to pull the trigger. It was a clean shot. Her friends wear buttons that say Seals are Meals. All of this is by way of answering a very southern question: Why don't they just move? The reason is that they would have to give up what they are. The core values of hunter-gatherer societies are sharing, family, and a sacred connection with the land. "It's an extension of our soul," says Aviaq Johnston, a friend of Jena's. These are just the opposite of the values developed in modern industrial societies. Many southerners come up to the North and fall in love with it and stay. That's why. They find what was missing in the South. Jena wants to be a bridge between the worlds of north and south, traditional and modern. She plans to be a nurse practitioner – someone who can help overcome the mistrust that the older people have of outsiders. "A lot of them don't believe in Western medicine," she says. "I can explain it in their language so that they can understand." She wants to fight for more medical resources and staff in small communities. She wants to be a good example for young people. Her life has by no means been easy. But neither was her grandmother's. When Nunavut came into being in 1999, some people predicted that it and its people would never become self-sufficient. Too few people; too much land; too many problems. But there are many Jenas now – young people who are full of resolve and hope. "I love being part of something bigger," she says. "Once I make up my mind, it feels like the universe is helping me."